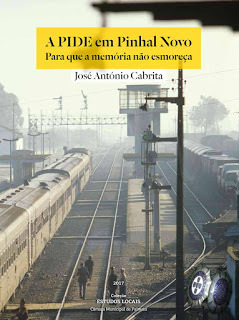 In this work that focuses on the action of the PIDE, José Cabrita explores the documentary archive of the political police, giving voice to several testimonies of those who went through the prisons of Tarrafal or Peniche, as well as their relatives and friends. The book is a tribute to the political prisoners of Pinhal Novo, victims, for 48 years, of the torments of the fascist dictatorship. José António Cabrita studied and taught Sociology, and also devoted himself to the research of various themes, such as the culture of Palmela and the historiography of Pinhal Novo. By Nuno Monteiro and Desidério Macau. Image: Cover of the book, designed by Jorge Ferreira, photograph by Maurício Abreu.